This chapter explores the intersections of information policy and government use of social media to interact with members of the public, using the policies and initiatives of the United States federal government as a case study. Following a discussion of the opportunities and challenges that social media presents to governments as a means to interact with its citizens, this chapter details key policy instruments related to government use of social media and the access issues that these policies do not adequately address. 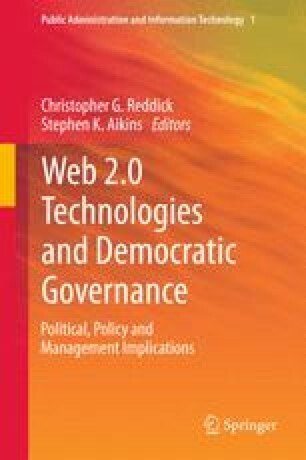 This chapter then examines the ways in which access perspectives already used in different areas of policy and design values implemented in various e-government projects present opportunities to frame government use of social media in a manner that would be inclusive of as many members of the public as possible. This chapter concludes by presenting ways in which policy could shape more inclusive use of social media by governments. Fox, S., & Livingston, G. (2007). Latinos online: Hispanics with lower levels of education and English proficiency remain largely disconnected from the Internet. Washington, DC: Pew Internet and American Life Project. Available: http://www.pewinternet.org. General Services Administration (2010). Social media handbook. Available: http://www.gsa.gov/graphics/staffoffices/socialmediahandbook.pdf. Howard, A. (2011). Pew: Disability or illness hinders many Americans from using the Internet. Available: http://Gov20.govfresh.com.